This fine art reproduction features an image painted by famous bird artist John James Audubon. 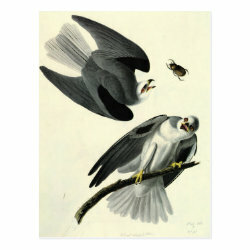 Here a pair of White-tailed Kites are depicted in dynamic, lifelike form. One bird perches on a branch while a bird in flight chases a large beetle.